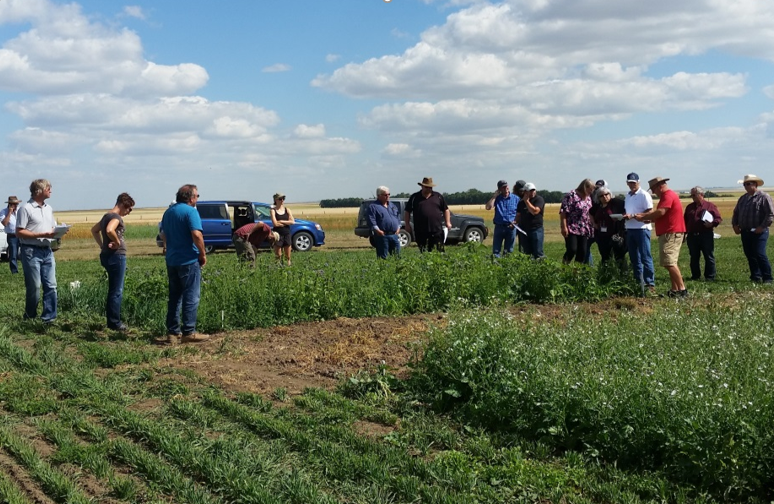 An impromptu tour of some of the organic field trials at the Swift Current Research and Development Centre, of Agriculture and Agri-Food Canada, was held on August 9th. Participants learned about an intercropping trial which is investigating the impact on weed populations, soil fertility, pests, and crop yield/quality. Another study is aimed at determining if diversified cropping strategies, including cover crop mixtures, can improve the sustainability of organic crop production. Participants also visited a bioherbicide, Phoma macrostoma, trial. Additionally, participants visited ongoing crop studies on the impact of tillage intensity and frequency on organic crop production, and on the influence of cover crops with allelopathic potential on perrennial weeds, soil quality, and productivity of the subsequent cash crop. The organic trials at Swift Current are being financially supported by the Western Grains Research Foundation (through the Organic Science Cluster II), SaskWheat, SaskPulse, Grain Millers, and Agriculture and Agri-Food Canada.